In a study on risk-taking (Gonzalez et al., 1994), a questionnaire comprised of several self-report scales, including two standardized scales and several others we had developed (Field & Yando, 1991), was administered to 440 adolescents (attending a public school) to assess differences between high and low danger risk-takers on relationship and personality variables. Danger risk-takers reported less intimacy with their mothers and greater drug use than their non-risk-taking peers. Similarly, in another study, adolescents' intimacy with parents and friends was noted to be a protective factor (Field et al., 1995). In that study, adolescents' perceived levels of intimacy with their mother, father, and close friend were examined as a function of demographic, family, school, and psychological variables. Students who had greater intimacy with their parents had greater interest in school, higher self-esteem, lower depression, and lower risk-taking scores. We then added items to the above questionnaire to tap variables related to anger in a sample of 89 high school seniors attending a private high school (Silver, Field, et al., 2000). One yes-no item stated: "Sometimes I get so angry that I worry I will become violent." In this middle to upper socioeconomic status sample, 58 students responded no and 31 responded yes. Splitting the groups by yes-no responses, the anger group (versus the nonanger group) had: (1) less intimacy with their parents, (2) more frequent use of marijuana and cocaine, (3) a lower grade point average, and (4) higher depression scores. In an attempt to investigate whether verbal and physical intimacy was lacking early in life in aggressive/violent children, we studied young children with conduct disorder and their mothers (Field et al., 1987). The children were observed in free play and puzzle completion tasks both alone and with their mothers. The mothers of conduct disorder children reported more self-depression and less nurturant childrearing practices. The conduct disorder children were more hyperactive and less interactive during the play sessions, and their mothers were less interactive and more disapproving than the other mothers. 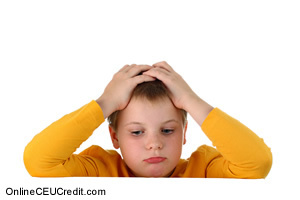 In a study on social anxiety and aggression in behaviorally disordered children (Gonzalez, Field, et al., 1996), 39 boys (mean age = 10 years) attending classes for behaviorally disturbed children were given questionnaires on trait anxiety, social anxiety, empathy, depression and self-esteem, and the teachers rated them on aggression. It was hypothesized that anxiety and empathy attenuate aggression. Contrary to our hypothesis, anxiety and empathy scores were not correlated with aggression. However, the children's depression scores were high. As already described, a large study on 49 cultures documented a strong relationship between less physical affection toward children and later aggression/violence (Prescott, 1990). We elected to compare France and the U.S. on physical affection toward children because Jourard (1966) had documented more physical contact in the French versus the American culture. In our first cross-cultural study, preschoolers in America were touched less and were more aggressive than preschoolers in France (Field, 1999a). In that study, 40 French and American preschool children were observed on playgrounds with their parents and peers. The American parents watched and touched their children less than did the French parents. The American children played with, talked with, and touched their parents less and were more aggressive toward their parents. During peer interactions, the American children touched their peers less, grabbed their peers' toys more, showed more aggression toward their peers, and showed more fussing. In a similar study, 40 adolescents were observed at McDonald's restaurants in Paris and in Miami to assess the amount of touching and aggression that occurred during their peer interactions (Field, 1999b). The .American adolescents touched each other less and were more aggressive toward their peers compared with the French adolescents. The American adolescents (versus the French adolescents) spent less time touching (leaning against, stroking, kissing, and hugging) their peers. Instead, they showed more self-touching and more aggressive verbal and physical behavior. In a series of studies, we provided more physical contact for violent and conduct disorder adolescents by giving them massage therapy. In the first study (Field et al., 1992), a 30-minute back massage was given daily for a 5-day period to 52 hospitalized conduct disorder adolescents. Compared with a control group who viewed relaxing videotapes, the massaged adolescents were less depressed and anxious, had lower saliva cortisol levels after the massage, and their nighttime sleep increased over this period. In addition, the unit nurses rated them as being less aggressive and more cooperative by the last day of the study. In the second study (Diego et al., 2002), 20 violent children and adolescents (mean age = 11.4 years) were randomly assigned to a massage therapy group or a relaxation therapy group to receive 20-minute therapy sessions twice a week for 5 weeks. The massaged adolescents had lower anxiety and cortisol levels and improved mood after the first and last sessions. By the end of the study, the massaged adolescents showed more empathy and were rated as being less aggressive toward objects and less aggressive in general by their parents. The massage therapy group also showed lower dopamine levels by the end of the treatment period. The relaxation therapy group showed no such improvement. The preceding section contained information about violence and touch deprivation in adolescents. Write three case study examples regarding how you might use the content of this section in your practice. According to the study done by Field et al., what were the benefits for students who had a greater intimacy with their parents? Record the letter of the correct answer the CEU Answer Booklet.